The college is in the very heart of the Dhanbad city and is easily accessible to its students, by road and rail, which made the college popular among the students, especially the girl students and their parents. The location of the college is not only the reason for its popularity but also the regular classes, quality education and use of modern tools and technology in teaching and learning by its highly qualified, dedicated and committed faculty members and friendly supportive staffs. Catering to the needs of fifteen thousand students, coming from neighboring areas of Dhanbad and adjacent West Bengal, the college starts in the morning and remains active till late in the evening. Big magnificent old double storey science building, icon of the college, has large, airy, well lighted lecturer theaters, laboratories, General Library, Computer Labs and Language labs that facilitate students in their career building and personality development programmes. The College has an Administrative Building, Social Science Building and one MP Hall with a sitting capacity of 200 students where cultural activities, seminars and conferences are held. The built-up area is about in three acres and ample open space for play-ground. The college campus is green and clean creating ambience and environment for quality higher education. Along with regular university under graduate and postgraduate programmes the college also runs vocational selffinancing courses in a few subjects and houses two distance learning university’s centres – Indra Gandhi National Open University (IGNOU) and Nalanda Open University (NOU). In the year 2014 the college was awarded grade ‘B’ with CGPA 2.58 by the National Assessment and Accreditation Council, Bangalore establishing its (college) credentials as an institute imparting quality higher education to its students and other stake holders. 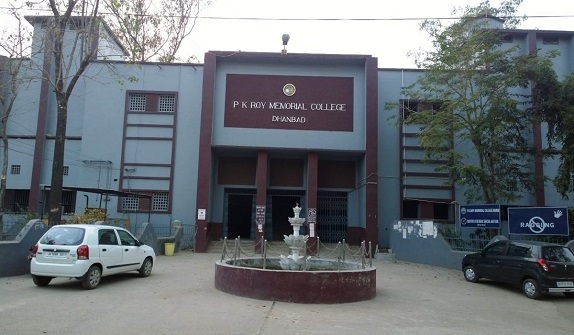 Last year, the college was identified by the State Government, to elevate it as a Premier College of Jharkhand and there has been high inputs of resources to renovate the old structures and new academic and sports complexes are coming up to cope with the space crunch and make the college a Premier institution of higher education in Jharkhand. To achieve the three cardinal principles of education policy viz. access, equity and quality, P. K. Roy as it is commonly known, has started SwayamPrabha Classes, MOOCs and is taping other facilities of Digital India programme. The college is an institutional member of National Digital Library of India and provides access to 61 lakh digital books to its students and teachers. The INFLIBNET facilities make the faculty members and other research scholars to have access to substantial number of National and International e-journals. The college has started EXCEL programme of TISS to facilitate students in development of soft skills and make them employable. The Language Laboratory and the Computer Centre of the college are also other common facilities for the students that help them in improving their skills. Over and above the Placement Cell of the college help them in getting employment in different companies or for their startups.